This is an entire day to explore Bukhara's Old city and visit its multiple monuments and bazaars there. 5- External Mausoleums: Ismail Samani and Chasmai Ayub. We take our breakfast late as the hotel administrator suggested yesterday: forecast for this morning was cold and, as the breakfast is served outdoors, the earlier the cooler. We talked about our train tickets with him too and, as the station is out of the city and tickets can be purchased online, they will get our tickets. 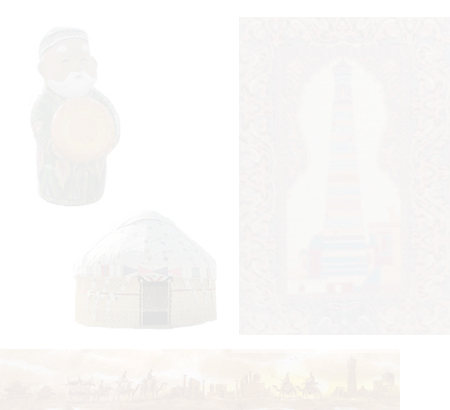 So, it’s around 11 AM when we’re ready to explore Bukhara with our winter clothes, like yesterday. Our plan for today is starting by the furthest highlights, out of the walled city, and we walk to there, avoiding to stop when passing by Poi Kalon or The Ark. Eva makes some shopping in the way, though. Soon we’re between Modari Khan and Abdullah Khan madrasahs. 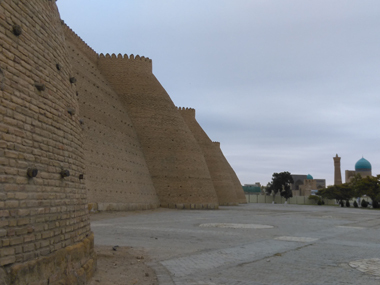 Then we walk a bit more further and we need to ask several times while following the road to reach Ismail Samani Mausoleum, one of the most iconic buildings in Bukhara. We pay 4000 soms to get into the small interior. It’s just a bit deeper in the park, just where it ends, until Chasma Ayub, with a couple of modern buildings around. Just across the road we can see a big market, but we turn around to walk back to the Old City going through the park as a shortcut. When we can see The Ark again, at our left Mosque Zhodja Zaynuddin is full of live: A crows in the entrance, all men, are praying. If we had some doubt about getting in there or not, now it’s clear for us and we just make some pictures from outside. The walls and entrance for The Ark are fabulous, a must-do in Bukhara with no doubt. The right wall, besides, has Old City’s skyline in the background, leaded by Poi Kalon complex, where we’re finally heading now. As we thought when planning today, we’re in front of Poi Kalon by lunch time but, as we’ve got a late breakfast today, we go to explore the complex before. The Square is after a barrier of parked cars. We get into Kalyan Mosque, which is very beautiful and, of course, admire the massive minaret which leads the square and this city’s sky. Inside Mir-i-Arab madrasah, in front of the mosque, there is nothing to see but is spectacular from outside. After this, we get into Minor Restaurant, with the best views to Poi Kalon, some minutes after 3 PM. We eat a sort of soup with noodles and vegetables for each one by 30000 soms. We come back to the hotel for a rest and leaving the shopping. We’ll leave later today, at dark, for a walk through bazaars and some dinner in the restaurant in Lyabi Hauz. We eat a chicken brochette by 50000 soms. We’ve visited the most of the Bukhara’a highlights today and there is very few pending for tomorrow.